Your pedalboard setup is packed with effects pedals and you don’t want to waste that valuable space placing a power supply. The Universal Power Supply Support is a must-have for pedalboard planners, as you will keep your pedal power supply securely placed underneath the board! This universal power supply support can take and securely protect any pedal power supply that does not exceed 47mm height nor 195mm width. For those models not compatible due to the size restrictions, check out our Universal Power Supply Support Simple which can hold power supplies of up to 57m high. This support isn’t compatible with XS1 pedalboards, as they don’t include adjustable feet by default and remain flat on the ground. Designed to attach to the pedalboard using the existent grooves, it can be easily assembled and disassembled, as many times as needed. Made of aluminum, this universal power supply support ensures a sturdy protection for the best pedal power supplies in the market. Its front piece will protect cabling from disconnections and damages, while the anti-slip inner faces will keep your pedal power safe in place. The hole on the base of the universal power supply support will allow you to route cables in a tidy manner; you can also use one of the tidy cable options available to attain a neater and more efficient cable management for your custom pedalboard. This accessory holds the pedal power supply by adjusting a plastic nut to the stud bolt, which will adapt to the height of the device. 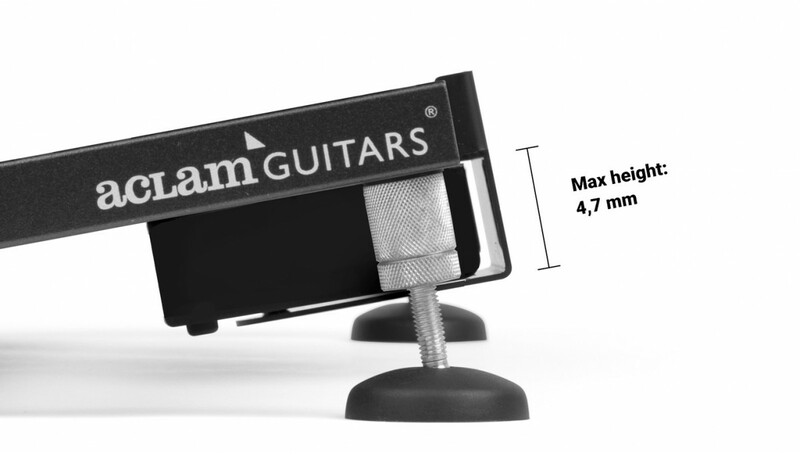 Buy now the most popular Aclam Products for Guitars accessory and reserve the top side of the pedalboard for your favorite effects. Combine it with other Aclam accessories to build the best custom pedalboard possible adapted to your needs. If you are new to Aclam, check out our Special Deals at our online store, you can find kits which include the Smart Track® pedalboard bundled together with universal power supply supports and more!